Is it from a children's story or nursery rhyme in French, such that the reference is immediately obvious to French speakers? I wouldn't have understood it without the picture, but with the picture the implication is very clear. Oie refers to "pas de l'oie", i.e. goose step, which is how fascists march. This is an allusion to fascism, and to nazism in particular. The allusion is recognizable not only from the way the goose is stepping, but also from the style of the drawing which is reminiscent of 1930s political posters. 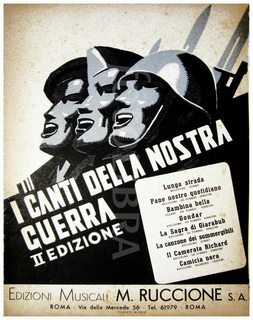 This this poster claims that the "loi travail" (labor law) is either the product of a fascist government, or a step towards a fascist government (fascism at work, or working towards fascism). I have a vague memory of a somewhat famous poster with a similar style that could have been direct inspiration, but I can't find it in an image search and I may well be imagining things. Here is something in a similar style: the cover of a book of fascist songs published in Italy in 1935. Note that I don't think everyone in France would get the reference to fascist marches. But people who would draw this poster definitely have this in mind. It comes from "pas de l'oie", aka goose-step, the stilted way some armies have their soldiers march, especially during parades. The implication here is that the government treats the working force as little soldiers it can order around as it pleases. it is an ironic pun as both sentences sound the same when you say them. It is meant to decry a law, here the "loi travail" (work law), by telling that people is only considered as a herd. 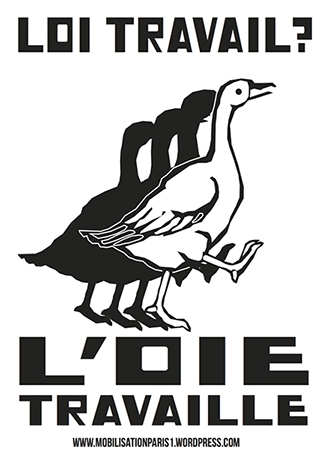 Normally you would tell people are sheep but for the intend of the pun, it has been decided here to use goose to tell "l'oie travaille" (goose works) ans make the sentences sound the same, to reinforce the impact. Not the answer you're looking for? Browse other questions tagged politique or ask your own question.